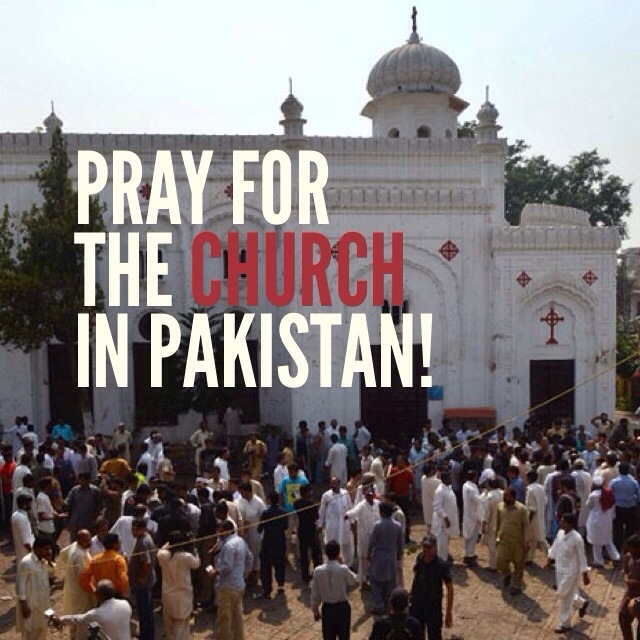 Pray for the Persecuted Church in Pakistan! PESHAWAR, Pakistan — A suicide attack on a historic Christian church in northwestern Pakistan killed at least 75 people on Sunday in one of the deadliest attacks on the Christian minority in Pakistan in years. The attack occurred as worshipers left the All Saints Church in the old quarter of the regional capital, Peshawar, after a service on Sunday morning. Up to 600 worshipers had attended the service and were leaving to receive free food being distributed on the lawn outside when two explosions ripped through the crowd. Author georgepwoodPosted on September 22, 2013 Categories The Global ChurchTags pakistan church bombingLeave a comment on Pray for the Persecuted Church in Pakistan! Paul Marshall, Lela Gilbert, and Nina Shea, Persecuted: The Global Assault on Christians (Nashville: Thomas Nelson, 2013). $16.99, 368 pages. Saeed Abedini is a Christian minister currently imprisoned for his faith in Iran. A native of that country, Abedini converted from Islam to Christianity in 2000 and became a leader in Iran’s house-church movement. In 2005, he moved to America with his wife, Naghmeh, and became a naturalized citizen here as well. In the summer of 2012, he returned to Iran to visit his family and to build an orphanage in the city of Rasht. He was arrested and indicted on unspecified national security violations. On January 27, 2013, he was sentenced to eight years in prison for his house-church activities and for evangelizing Muslims. The American Center for Law and Justice represents Naghmeh Abedini and has started the #SaveSaeed campaign to bring attention to his plight and secure his release. Though not mentioned by the authors of Persecuted, because his case arose while the book was in production, Saeed Abedini is yet another individual example of their thesis: “Christians are the single most widely persecuted religious group in the world today” (p. 4). Instead of compiling statistics on this problem, the authors of Persecuted document the stories of individuals and communities who, like Saeed Abedini, are suffering because of their faith in Jesus Christ. Paul Marshall, Lela Gilbert, and Nina Shea are veteran advocates of religious freedom. All are affiliated with the Hudson Institute, and Shea directs that think tank’s Center for Religious Freedom. Each has written extensively on the topics of religious freedom and Christian persecution. Marshall and Shea co-authored Silenced: How Apostasy and Blasphemy Codes Are Choking Freedom Worldwide (2011). Marshall edited Religious Freedom in the World (2007). And in 1997, Marshall and Gilbert published Their Blood Cries Out, while Shea published In the Lion’s Den. Chapters 5–8 focus on “radical Islam’s urge for religious dominance, which at present is generating an expanding global crisis” (p. 9). Abedini’s case illustrates the tenuous situation of Christians in many Muslim-majority countries. According to the authors, “The most widespread persecution of Christians today takes place in the Muslim world, and it is spreading and intensifying” (p. 123). In some countries, notably Iraq, centuries-old Christian communities are dwindling because of the persecution. And chapter 9 focuses on “national security states such as Burma and Eritrea” where “the military has sought to preserve its rule by any means necessary” (p. 13). Chapter 10, “A Call to Action,” outlines a strategy of information, prayer, and political action for religious-freedom advocates. Though persecution of Christians is the most widespread violation of religious freedom, the authors are careful to note that other religious groups suffer persecution too. Therefore, advocacy for the religious freedom of Christians must be advocacy of religious freedom for all. “Defending persecuted Christians and expanding religious freedom will also help other persecuted religious groups and minorities. Mandaeans and Yezidis in Iraq, Baha’is and Jews in Iran, Ahmadis and Hindus in Pakistan, Falun Gong in China, Buddhists in Vietnam, animists in Sudan, Shiites in Saudi Arabia, and Muslims in Burma all suffer imprisonment, exile, torture, and death at the hands of those who oppress Christians” (p. 291). Persecuted is a well-documented book on the persecution of Christians worldwide. I highly recommend it to any person interested in promoting the “First Freedom,” that is, religious liberty. Because nations that don’t respect freedom of religion generally don’t respect other human rights or civil liberties either, raising consciousness about this violation has the salutary effect of raising consciousness about those violations too. Religious liberty is the “First Freedom,” but anyone concerned about it will be ineluctably drawn to concern about second, third, and fourth freedoms as well. SaveSaeed.org: Saeed’s wife, Naghmeh asks you to take action for her husband. Share this using the hashtag: #SaveSaeed. Author georgepwoodPosted on March 7, 2013 Categories Current Events, The Global ChurchTags #SaveSaeed, Iranian perseuction of Christians, Naghmeh Abedini, Saeed Abedini1 Comment on SaveSaeed.org: Saeed’s wife, Naghmeh asks you to take action for her husband. Naghmeh Abedini and Jordan Sekulow appeared on Fox News today to discuss the latest letter from Saeed Abedini, who is imprisoned and being tortured in Iran. Kay, William K. 2011. Pentecostalism: A Very Short Introduction. Vol. 255, Very Short Introductions. New York: Oxford University Press. Pentecostal Christianity is the fastest-growing religious movement of the modern era. Over the past 100 years, it has grown from a handful of adherents to well over 500 million. Often associated with white, right-wing, American televangelists in the public mind, it is actually populated by poor, Majority World residents whose political commitments are diverse. William Kay’s Pentecostalism: A Very Short Introduction ably introduces this movement by sketching an outline of its history (chapters 1–3), theology (chapters 4–5), and sociology (chapters 6–7). A concluding chapter (8) speculates on possible trajectories for the size and influence of the movement. Kay includes a “Further Reading” list at the end of the book for readers who wish to delve more deeply into these topics. I highly recommend Pentecostalism as an introduction to this vibrant Christian movement for readers who know little to nothing about it.